Mark Ford is a marimba artist and the Coordinator of Percussion at The University of North Texas College of Music in Denton, Texas. As a Past-President of the Percussive Arts Society and the coordinator of one of the largest percussion programs in the United States at UNT, Ford is an active performer and composer. Mark has been featured as a marimba soloist throughout the United States at universities, festivals and music conferences. He has performed internationally throughout Europe as well as in Japan, China, Taiwan, Australia and South America. 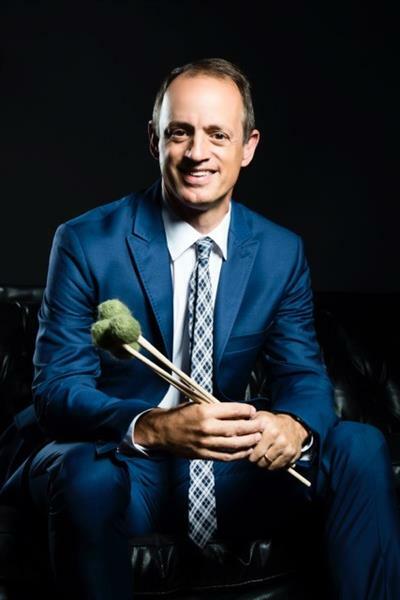 In addition to his duties at UNT, Ford is also the Artistic Director for the annual Drum Fest Marimba/Vibraphone Competition in Opole, Poland. With over three decades of performing, teaching and composing to his credit, Mark’s recordings have established his dedication to excellence in music. Ford’s solo marimba CDs, Stealing a Moment, Motion Beyond and Polaris, have become standards in the percussion world. His CDs have been described by PAS’ Percussive Notes as “beautiful, exceptional and virtuosic.” Mark has also recorded numerous concertos with the UNT Wind Symphony under the direction of Eugene Corporon. These include two DVDs and a CD with Japanese virtuoso marimbist Keiko Abe as well as the latest 2017 Wind Symphony recording, Stubernic Fantasy, which includes marimba/percussion concertos by Jennifer Higdon, Daniel McCarthy, Keiko Abe and Ford (this recording will be released in December 2017). As a composer Mark Ford has written popular works for solo marimba and percussion ensemble including Marimba Heritage, Head Talk, Polaris, Kingdom Lore Fanfare, Stubernic, Afta-Stuba!, Morning Light, The Surface of Life and Coffee Break (co-composed with Ewelina Ford). His Stubernic Fantasy Concerto was premiered in Poland (orchestral version by The Opole Philharmonic) and the Mid-West Band and Orchestra Convention (wind ensemble version by the Lone Star Wind Symphony) and has been performed on tour by the US Navy Band and the US Air Force Band. His compositions have been performed at universities and concert halls throughout the world and also featured on National Public Radio. His most recent works include Moon Chasers for solo marimba, IE2 written for the Ju Percussion Group in Taiwan and Pivot Point for saxophone quartet, marimba and cajon. Ford is also the author of Marimba: Technique Through Music, a four-mallet marimba method book published by Innovative Percussion, Inc. His new book for marimba, Marimba Songbook will be released in the fall of 2017. Ford has been recognized as a leading percussion educator, and his former students perform and teach throughout the country. Under his direction the UNT Percussion Ensemble has toured in Poland, Croatia, France and Belgium and also won the PAS International Percussion Ensemble Competition. Mark Ford proudly represents Innovative Percussion Inc., Dynasty Percussion, Bergerault, Zildjian, Evans Drum Heads, and Meinl Percussion as performing artist and clinician. Developing your interpretation of the music you play is one of the most important and satisfying aspects of music making. Your interpretation reflects your ideas and feelings about the music. Unfortunately, younger musicians usually concentrate only on understanding the notes and rhythms of a marimba solo. Obviously, this is important, but it’s only fifty percent of the job. Communicating your emotional connection with the music through your interpretation is essential to the “magic” of music. Think about how a certain performance or piece of music has touched you in the past. When you perform you want to connect with an audience in the same way that music connected with you. This list of standard marimba and vibraphone pieces has been complied by Mark Ford, William Moersch, Janis Potter and Ney Rosauro. Mallet suggestions are listed left hand to right hand 1-2-3-4. The first time you hold four mallets in an attempt to make music at the marimba can be pretty frustrating. The beginning four-mallet player has a lot to think about: moving intervals, proper grip, different strokes, and, of course, playing the notes! This beginning process can be overwhelming. Here are some marimba floor exercises that I have developed for beginners. The idea is to practice the technique of four mallets to gain confidence before playing the instrument. More information on marimba technique is covered in my method book, Marimba: Technique Through Music (Innovative Percussion Publications).